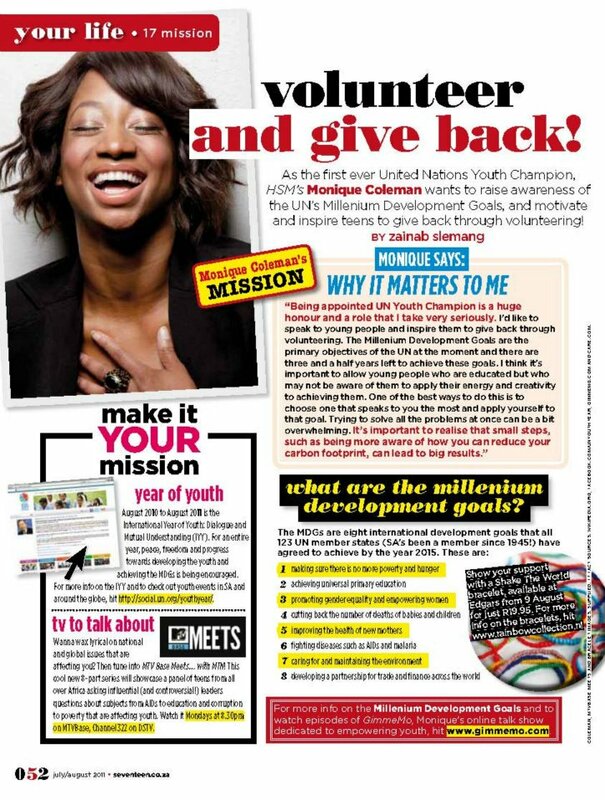 Credit: Seventeen Magazine (South Africa)- September Issue '11| Gimme MO Facebook. Gimme Mo’ is the brain child of Disney’s High School musical star, Monique Coleman. Widely known as “Taylor” in the hit TV series, Coleman left Hollywood to find another way to change the world. She did so by launching a new talk show, aimed for teens this fall. Coleman’s show is set to leave a mark as she navigates her way through a plethora of issues that teens face on Gimme MO’. Airing every Sunday at 6:30 PM EST on GimmeMO.com, she is LIVE! In New York City? Tune in on channel MNN1 or channel 34, if you have Time Warner cable. Tweet along using, #gimmemo @gimmemotalk. We’re proud partners of GimmeMO and we absolutely adore her team. We will be hosting campaigns and other sweet things in the next several days. We look forward to our new partnership because it goes hand in hand with our core mission with educating youth about certain issues, while encouraging leadership and advocacy on topics they care about.